My birthday was way back in October and my brother and his girlfriend gave me vouchers for John Lewis. 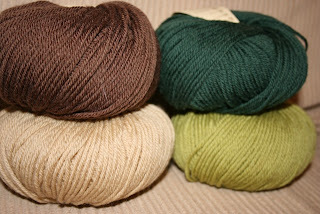 3 balls of Wendy Fusion in Juniper Berries colourway. Saw this on Frog in Knots blog in November and liked the colours. 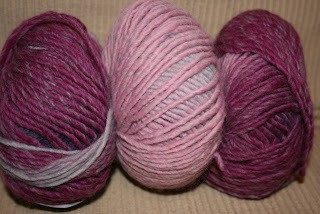 4 balls of Rowan Pure Wool DK to have a go at a felted bag. 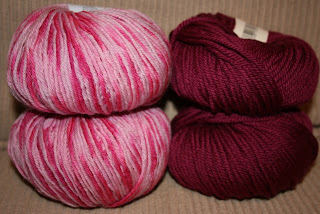 2 balls of Jaeger Baby Merino DK to make gloves, and 2 balls of Debbie Bliss Cashmerino Chunky to make a hat. So thank you Alex and Theresa. I'm away now to get cast on! The baby merino is really pretty. Well, so is the Wendy Fusion.